You’ll want to be sure to get asparagus in season that seems stiff and snappable. If you bent it in half it would snap rather than bend into submission. Toss your limp stalks in the soup or to the dogs…or maybe the compost pile. The supplies you will need are a large pot, a skillet (non-stick or seasoned cast iron), and a large bowl filled with ice water. First, you’ll need to rinse your asparagus in cold water and cut of the woody ends. If you have ever bitten into a stalk of asparagus only to find that your chewing is getting you nowhere and it is stringy and inedible — chances are that it is either OLD or the woody end was not properly cut. In this picture, you can see approximately what I cut off to ensure that the woody part is removed. The top is asparagus that are cut and the left bunch still has the woody ends. Next, I like to cut my asparagus into bite-sized pieces. You can opt to keep your stalks long or cut them smaller but just be sure that they fit comfortably into your pot of water. Fill a pot with cold water and put in 3 large pinches of salt. I would guess that I use about 2-3 tbsp of kosher salt. Salting the cooking water helps to flavor the asparagus so that it is perfectly seasoned when it’s time to eat. Bring water to a boil and add the cut asparagus and stir frequently for about 4 minutes. I would start testing it at 3 minutes if you have cut smaller pieces and leave it in no more that 5 minutes. The asparagus should be perfectly tender and to the tooth. Once your asparagus has reached its al dente point, immediately use tongs to place the asparagus into a bowl of ice water. This will shock in the bright green color and also stop it from cooking to preserve the perfect texture. 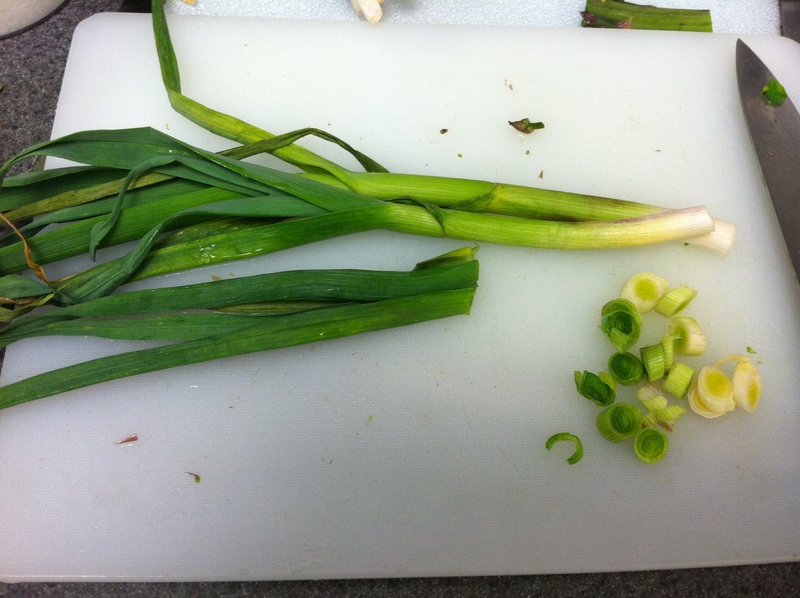 Next, cut up the bottoms of four sprigs of spring garlic and a quarter of a large shallot. 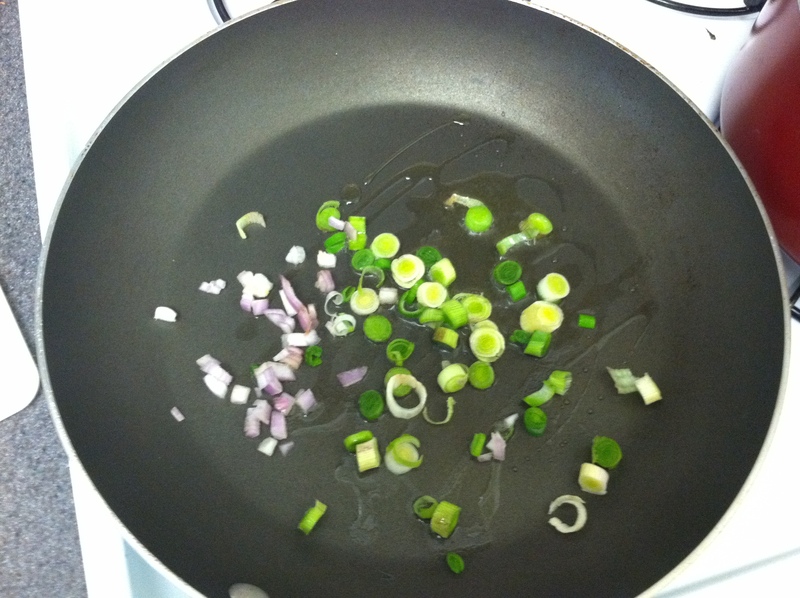 In a large skillet, heat about 2 tbsp of olive oil over medium-high heat. Add the shallots and garlic. Drain the asparagus from the cold water in a colander and pour it into the hot pan with shallot and garlic infused olive oil. Sprinkle with a pinch more of salt and turn it in the pan for a minute or until glossy with the oil. Pour the finished asparagus onto a plate and now it’s time to make the sauce. 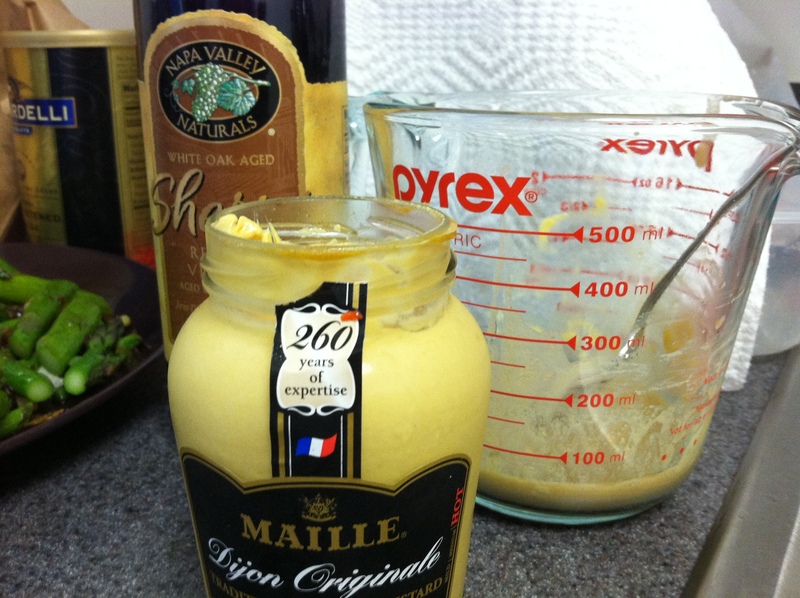 In a bowl, whisk together a tsp of dijon mustard and 1.5 tbsp. of sherry vinegar. Drizzle in about 3 tbsp of extra virgin olive oil and whisk together until emulsified. Pour over the asparagus and enjoy! As you can see, I served mine with a piece of baked salmon and a kale and red pepper stir fry and some left over Bhutanese red rice that I’d had in the freezer. An easily delicious Wednesday evening. And for dessert, I made banana “ice cream” with a little bit of cherry jam, chocolate chips, and peanut butter mixed in.